A non-profit corporation whose purpose is to promote and maintain public and scientific interest and research in bromeliads throughout the world. There are 4 classes of membership: Annual $10.00; Sustaining $15.00; Fellowship $25.00; and Life $200.00. All memberships start with January of the current year. President Elmer J. Lorenz, Calif.
1st V.P. Leonard Kent, M.D., Calif.
2nd V.P. W. R. Paylen, Calif.
Rec. Secy. Jeanne Woodbury, Calif.
Corres. Secy. Kathy Dorr, Calif.
1974-1977: Eloise Beach, Kathy Dorr, George Kalmbacher, Fritz Kubisch, W. R. Paylen, Amy Jean Gilmartin, Robert Read, Edgar Smith. 1975-1978: Jeanne Woodbury, George Anderson, Charles Wiley, Ervin Wurthmann, Victoria Padilla, Wilbur Wood, Thelma O'Reilly, David H. Benzing. 1976-1979: Robert G. Burstrom, Leonard Kent, Elmer J. Lorenz, Edward McWilliams, Harold W. Wiedman, Tim Lorman, Sue Gardner, Herbert Plever. Adda Abendroth, Brazil; Luis Ariza Julia, Dominican Republic; David Barry, Jr., USA; Olwen Ferris, Australia; Mulford B. Foster, USA; Marcel Lecoufle, France; Harold Martin, New Zealand; Dr. W. Rauh, Germany; Raulino Reitz, Brazil; Walter Richter, Germany; L. B. Smith, USA; R. G. Wilson, Costa Rica. Published six times a year: January, March, May, July, September, November. Free to members. Editorial Board: Dr. R. W. Read, Identification; Dr. W. Rauh, Identification; Mrs. Kathy Dorr, Advertising; Elmer J. Lorenz, Index; Lawrence Mason, Jr., Science; Robert Burstrom, Regional; Edgar Smith, Regional. Articles and photographs are earnestly solicited. Length is no factor. Please mail copy and all questions to the Editorial Office, 647 South Saltair Ave., Los Angeles, California 90049. The complete life cycle of a plant is truly a marvelous process. Having a hand in the process adds to the thrill. If you have acquired some experience in raising and blooming bromeliads, you may wish to extend your skills to include hand pollination, harvesting seed, sowing the seed, and caring for the young seedlings. The species aechmeas that develop berry fruit provide good material for the novice. 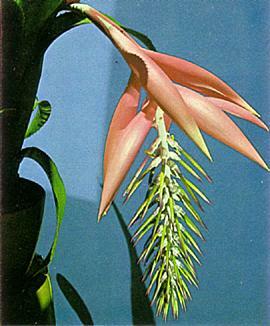 Included in this category are Aechmea fulgens, A. ramosa, A. lueddemanniana, A. mexicana, A. castelnavii, A. nallyi, A. racinae, A. miniata, A. victoriana, A. angustifolia, A. bracteata, A. coelestis. A. mertensii, A. penduliflora, A. tillandsioides. The flowers are usually accessible, the flower parts easily identified, the berries visible, and the seed evident. Since the anthers and the pistil in the aechmeas are at approximately the same height, some may self-pollinate, the close proximity bringing the pollen from an anther onto the pistil at a propitious moment and thus causing fertilization. Also you may have insects in your area that are attracted to the pollen or to the nectar secreted at the tip of the pistil. In that case the insect will spread the pollen within one flower, from one flower to another, or from the flower of one plant to the flower of another. Some plants require the pollen from the flower of the same species but from another clone before fertilization will occur. If you are intent on getting seed on your plant, it is best not to rely entirely on nature. You will increase your chances of obtaining seed if you will enter into the pollinization process yourself. (Note: not all of the aechmeas will open their petals for you. These types are naturally pollinated by insects with a long proboscis, but you can accomplish the same effect by spreading the petals and pollinating as described below.) In most instances the pollen in bromeliads remains viable for a period longer than the time that the pistil will receive it. In aechmeas you can expect the pistil to receive pollen over a period from as little as 15 minutes to more than an hour, depending on the species concerned. The pollen will ripen shortly before this period begins and will remain viable considerably longer. The reception period can be determined by observing the pistil with a magnifying glass. When a bead of nectar is present on the tip of the pistil, it is receptive to the pollen. The aechmeas are usually fertile during the early daylight hours. Using a small artist's brush or the tip of a pencil, dab into the flower and look to see if you have picked up any pollen. It will show as a bright yellow powder or a coarser meal on your brush or pencil. Proceed from flower to flower, if you have more than one open, and dab several times at each to assure that the pollen reaches the pistil. If you are not sure that the pistil is receptive, it is recommended that you repeat the process at half-hour intervals throughout the morning. Do not be surprised if you do not find ripe pollen. 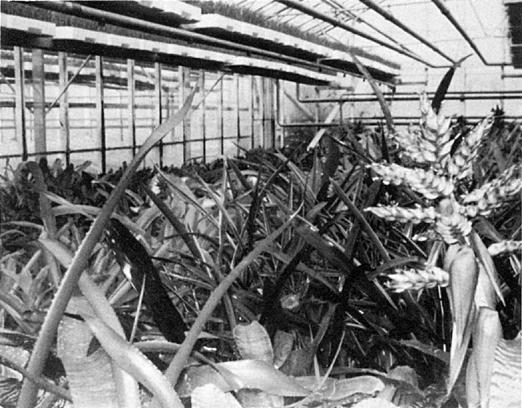 Since most bromeliads have alternate means of propagation, they do not always have perfect seed production mechanisms. Frequently a plant will simply not produce pollen. Such cases may respond to pollen from another specimen of the same species, and it is even believed that seed production can be stimulated by the presence of pollen from a different species even if actual hybridization does not occur. A. Petals, showing pistil and stamens. 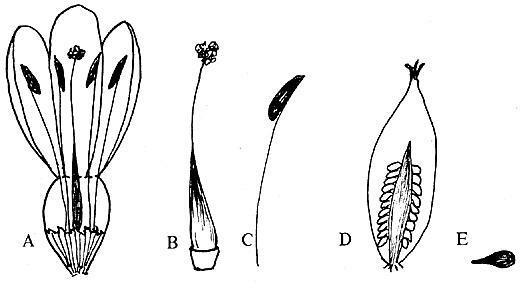 B. Pistil, stigma and ovary. D. Fruit, showing arrangement of seed. Cross pollination or hybridization is a bit more complicated. Most hybrids occur between two species of the same genus. Rarely can we succeed in crossing two plants from different genera. To cross pollinate, we take the pollen from one species and apply it to the pistil of another species. In the aechmeas, the parts of the flower are so close together that the pistil may accidentally pick up pollen from its own anthers and the cross is thus thwarted. To assure a cross, professionals will use a small manicurist's scissors to trim off the anthers before the unwanted pollen is ripe. When attempting a cross with a plant that does not respond to its own pollen, the cross might seem to be a foregone conclusion; however, as mentioned above, the seed may not carry any traits of the pollen parent, because the seed plant developed seed merely by being stimulated with another plant's pollen without actually transmitting the pollen's life force to the ovary. For these reasons, only the resulting seedling plant can tell us whether or not the cross occurred. After pollination, we must continue to care for the plant appropriately until a berry forms and seed ripens. This waiting period may be from 2 to 10 months, depending on the species. In almost all instances the ripe period is signaled by a change of color in the berry. This color change may be from orange to brown, from red to brown, from light blue to purple, or from white to blue or purple. The color change usually occurs quickly — within a period of a day. When the berry type fruits have reached the harvesting stage, the fruits will be soft to the touch and a gentle tug will easily remove the berry. You should harvest each berry as it ripens and not wait for the later ones to be ready. Delay could cause fatal spoilage. On the other hand, harvesting the berries before the ripening stage is reached could give immature seed and no germination. It will be noted that not all the fruits on a spike are ripe at the same time. Ripening occurs over a period of several days, one or two berries a day. Do not remove the spike from the plant until all fruits have ripened. To do so will stop development in the yet unripe berries. In the non-berry type aechmea blooms such as A. fasciata, A. orlandiana or the cob type such as A. bromeliifolia, A. triangularis or A. pineliana, the difference in the flower head arrangement and the absence of a distinct color change in the fruits when ripe make harvesting a little more difficult. Since in a number of aechmeas the fruit is concealed in the bracts or buried in the base of the cob type bloom, a close check will reveal the fattening of the fruit and only a slight, if any, color change when ripe. However, a gentle tug on the fruit and its easy removal will indicate the fruit is ready to harvest. To harvest the seed, pick the berry and squeeze its contents into a small jar. You will immediately recognize the seed. It may be long and thin or shaped like a tiny egg. (On rare occasions, as in A. chantinii, — which is one of the aechmeas which require hand pollination in the absence of insects — the seed may actually have germinated in the berry. In that case, you will see scraps of green. These tiny plantlets are usually hardy and may be plucked out and grown as any other seedlings.) When you have harvested the ripe berries and have them in a jar, fill the jar half full with water, tighten the lid and shake the jar. Repeat the shaking frequently for the next 24 hours. It may also be advantageous to include a drop of liquid detergent in the jar. This agitation and soaking will remove much of the sticky pulp from the seeds. After one day in the jar, the seeds must be dried. Pouring the seeds and liquid into a small mesh sieve, such as a tea strainer, is a simple method of removing the seed from the jar. Spread them on a sturdy paper towel. After one to two days, depending on the humidity, the seeds should be scraped off and stored. It is important that the seed be allowed a certain amount of air exchange so that they will not mould or germinate prematurely. Therefore keep them in a paper envelope — not in plastic. A dry glass is acceptable only if the seeds are completely dry and if the jar is large enough to assure adequate air for the seed. The seed are, of course, ready for planting as soon as they are harvested. (Unless you really need thousands of plants all alike, be kind and helpful and send some to the seed fund.) But contrary to previous reports you may have seen, the seed of many bromeliads will remain viable for as much as 12 months. The preparation of seed beds for this type of bromeliad is relatively simple. You will need a plastic container with a transparent lid such as a plastic shoe box, refrigerator dish, etc. For a small planting you can use an inexpensive plastic beverage glass such as those used on airlines; the cover can then be a plastic sandwich bag. The bottom of the container must be perforated. A hot nail held by pliers will work. Handier is an electric soldering gun. The planting medium should be a fine textured commercial house plant mix. It might be helpful to sterilize the container with a rinse in bleach water and to sterilize the mix by heating in a pressure cooker, oven, or a micro-wave oven, but our modern spectral fungicides such as Benlate, Benomyl or Physan will obviate any damping-off problems. Prepare some pure water — rain water or bottled drinking water is recommended and absolutely necessary if your water is as heavy in minerals as ours in southern California. Never use water from a water softener. Add the fungicide as recommended by the manufacturer. Use this water to saturate the soil. Fill the containers about one inch with the moistened mix. Compact it with your fingers to obtain a smooth, firm surface. Spread the seeds on the surface so they are not touching each other. You may want to note the number of seeds so you can later compare it to the number of seedlings. Such information is important for further investigation and experimentation in the field of seed viability. Do not cover the seeds with the mix. Place a lid on the container, mark it with the name and date, and set it in a light, warm spot away from the direct rays of the sun. The top of a refrigerator is frequently used for seed germination, since it is warmed by the even heat given off by the refrigerant coils. How long will you wait before you see green sprouts? Germination usually occurs in about 14 days. However, if the seed is old, the period may extend to as much as 30 days. Keep a close watch on the seed beds. If they become dry, set them in a pan of pure water until the mix is damp again. Watering from above may shock the tiny organisms and cause the germination to stop. Even after the seedlings are well on their way, overhead watering may be fatal, because the tiny root system of the seedling may be dislodged from the medium. Continue caring for the seed beds by assuring them sufficient water and light. If they have been on the refrigerator, you may want to move them to a window sill that receives no direct sun. After about 3 or 4 weeks you should use a very weak solution of house plant fertilizer as you water. When the seed shows its first germination, it is usually a single leaf. However, soon another leaf will begin to appear. In a short period of time you will notice the second set of leaves beginning. At this point, the lid or covering on the container may be removed. This action should be done over a period of several days by moving the lid a small amount each day. 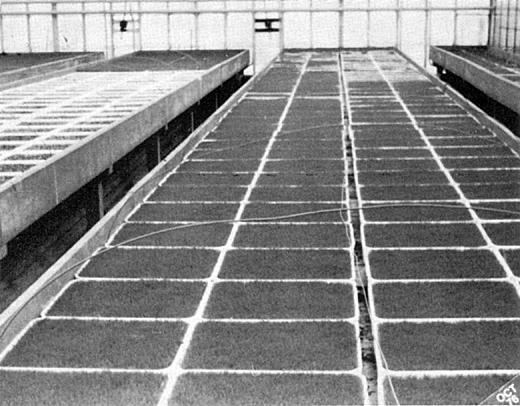 Gradually removing the lid averts damping-off by allowing the seedlings to become adjusted gradually to the different atmosphere. To provide humidity in the area of the seedlings, if they are being cared for in the house, small containers of wet sand or gravel may be placed in the area of the seedlings. When the seedlings have reached one-half inch or more in height and the third set of leaves is in evidence, move them into a larger community container. (In some instances you will find certain aechmea seeds will germinate on an apparent stem with the leaves developing at the top of the stem. In this case the transplanting should be delayed until a tiny root appears at the base of the leaves. Then they may be moved to the community pot with the seedling being placed so the base of the leaves rests on the medium.) Prepare the community pot with the same medium used in the germinating pot. The new container could be a pony pack, a propagation flat or a similar, shallow pan with good drainage. Pick individual plantlets from the seed bed with a knife tip, tweezers or some similar instrument and plant them in the new pot so that their leaf tips barely touch. Such close proximity helps to maintain a high humidity around the plants. The root systems may be very small and unable to hold the plants erect. A good aid at this point is plastic toothpicks used to support the wobbly seedlings. Bottom watering is recommended until the plants are quite stable, and misting daily with a spray bottle will keep the medium surface moist and also create humidity. Include a fungicide in the spray if there is any evidence of fungus. Continue using a weak fertilizer solution every two weeks. When the plants are again crowded — after 6 months or more — they may be transferred into individual pots. If the plants are showing sturdy growth and have a healthy, mature root system along with the hair-like seedlings roots, they may be placed in the medium used for mature plants and off-shoots. The size of the pot you use is important at this point. A pot at least 3 inches is recommended, because the medium in the very small pots will dry quickly and may cause some losses. If clay pots are used, it will be necessary to water more often, as the porous texture draws the moisture from the medium causing it to dry quickly. Plastic pots retain moisture much longer. Each time that the plants are transferred to a new pot, you may expect some losses. Even with good care, the loss amounts to about 10%. Give these casualties a decent burial and devote your attention then to the living. The smaller aechmeas such as A. mertensii or A. tillandsioides should reward you with a bloom spike in three years. The larger plants will take a little longer to reach their mature size. When that first inflorescence appears, you will enjoy pride and satisfaction at bringing a bromeliad through its complete cycle — from seed to seed. Fig. 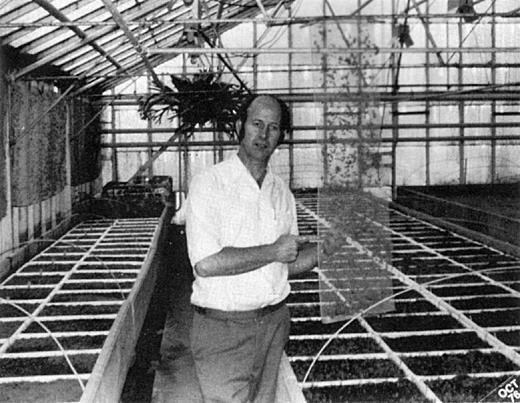 1 — Bak greenhouse showing seedlings. After having lived in the Netherlands for twenty-one years, it took me almost another twenty-two years of living in the United States to find out that many, many bromeliads are grown commercially in the Netherlands. Of course, and needless to say, during my first twenty-one years, I thought that only tulips were grown there. It was only after I had joined the Bromeliad Society that I realized how wrong I was. I had the good fortune of being able to correspond with Mr. Bak of the Firma Bak, commercial bromeliad growers in Assendelft, Holland. When I visited the Netherlands last year, besides visiting with my family, I intended to see as many bromeliads and nurseries as I could during my stay. Upon arrival at my brother's home in "The Hague," my sister-in-law suggested that I visit a bromeliad nursery that she had heard of. This place happened to be the same Firma Bak that I was hoping so dearly to visit. Bingo! Free transportation! I couldn't ask for more. After a very scenic ride from "The Hague" (Scheveningen) to Assendelft, going over some beautiful roads, making a right turn by the canal up to the bridge going along the Dijk (dike) we finally wound up at the wrong place. But after following the right directions given to us by a nice orchid lady — "Follow the cows, turn right by the sheep, and you'll get there," we finally reached our destination. Assendelft is a small community with one very, very long street. It is about thirty miles north of Amsterdam. If you are interested in buying at least one quarter of a million bromeliad seedlings, you know the place to get them. Forgive me, Mr. Bak, if I'm wrong about the size of your greenhouses and other statistics, for I lost count upon entering your first greenhouse. I was overwhelmed! The first question my sister-in-law asked was "Why do they grow grass here?" Indeed, the greenhouse looked like the length of a small football field with styrofoam flats sitting on cement benches with, and not exaggerating, millions of seedlings of guzmanias. At first glance it looked like an enormous field of grass. Mr. Bak started growing bromeliads in 1955 and has been tremendously successful in producing beautiful plants. The Firma specializes in guzmanias and vrieseas at this time. Most stores carry the following: G. lingulata 'Red', Vriesea splendens, different forms of Neoregelia carolinae, and Ananas comosus. The seedlings all come from home grown seeds and are only produced as ordered. As I said, there were about ¼ million seedlings growing in his greenhouses. These are kept very warm and humid — about 28-29°C., the humidity being at least 60%. Ventilating is done by automatic window control, depending on wind direction and many other factors. Even though it was very hot, even by Dutch standards, there are no fans for circulation. This seemed to be surprising considering the healthy condition of the plants. Fig. 2 — Mr. Bak holding netting on which he starts his seeds. All seedlings are planted in flats (I'm guessing again) about 12 × 12 inches in size. The planting medium is pure ground moss. No sand or no perlite is used. Supplemental light is provided by overhead mercury vapor lights. The lights go on at night and are left on for hours to insure good growing conditions. In other words, the bromeliads are treated as long daylight plants. Take note, indoor growers, long daylight means 12 to 18 hours of light. This is more than I give my bromeliads at home which are grown under lights. Mr. Bak uses rain water only. Luckily, the Netherlands is a good place for rain. I would like to inject my personal opinion about water. The city water in Holland consists of the same lime and salts as we have in Michigan — ingredients which spell sure death for certain bromeliads. In Michigan we are fortunate to have as much rain and snow as we need throughout the year — enough to keep me supplied for my one gallon a day to use for my plants. In the first greenhouse we entered we saw how Mr. Bak grows tillandsias from seed. Fig. 2 shows Mr. Bak holding a piece of nylon netting on to which he sows his tillandsia seed with great success. To my knowledge Mr. Bak is the only grower raising tillandsias from seed on a commercial basis in Europe. I may not be right in this respect, but I would venture to say that he has tens of thousands of tiny tillandsia seedlings growing at his nursery. Moving on to the next greenhouses (how many? maybe twenty?) we see all kinds of bromeliads happily growing. (See Fig. 3). I did not realize how many types of T. usneoides there are until my visit. There were perhaps five, six or more kinds — fine, heavy, curly, not so curly, etc. etc. Now we go to the latest and last greenhouses through the working area where many young people were transplanting seedlings into flats ready to be shipped. Between the work area and the last greenhouse is a hallway which was loaded with tillandsias mounted on cork. The noticeable difference walking into the hallway and the new greenhouse was the difference in temperature from a warm 29°C to a cool 20°C (72°F.) In the last greenhouse was a huge Guzmania lindenii climbing out of the pot, at least 8 feet high including the pot. Wow! Also, I had never seen such large G. musaicas — 24 inches high. There were many of these. Just about everything in this greenhouse is automated. The entire building is covered with curtains that open and close automatically. When the sun comes out the curtains close; when the sun disappears the curtains open. Thank you, Mr. Bak, for your precious time and your infinite patience in showing and explaining to us about your wonderful establishment. For those who visit Amsterdam, please don't miss going to the "Frij Universiteit" (Free University) in the city. The Botanical gardens are like a tropical paradise. Many bromeliads are to be seen. Over and over again one finds natural hybrids in orchids and many of these have now become species. The question arises, are there not natural hybrids in the Bromeliaceae, another family of epiphytic and terrestrial plants? There are no end to mutants in both families and no doubt hybrids between mutants have arisen. As I have mentioned in the article on "Mutants in Plants" there seem to be environments where mutants occur more than in others and in some species more often than in others. I would like to see in print observations from anyone who feels he or she has seen hybrids in bromels through an article in this Journal. 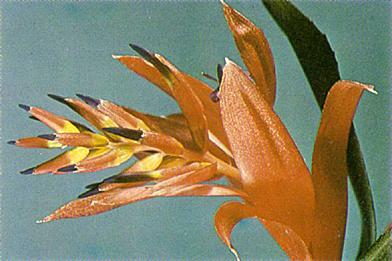 Man-made hybrids between genera within each of the three divisions of Bromeliaceae are known but none seem to have been widely spread or easy to grow. This is quite a contrast to intergeneric breeding in orchids. Is it true that most bromeliad species are self sterile and require sib crossing or even different clone crossing to get seed? How about someone writing up this phase of bromeliad culture and something about the peculiarities of some species which prefer to be females and others males like in other plants. I am sure someone could come forth with answers to some of these questions and help the Editor get more articles for the Journal. Unknown aechmea found along the road. Twenty-two years ago, two brothers, Micha and Reiko, ages about nine, had already crossed South America two times. Along with their mother and two sisters, they had sought aquarium plants, ornamental fish, orchids, and bromeliads. They had a number of hair-raising adventures, for the roads in the Brazilian interior, at their best, are just mule tracks, and their car was in poor condition. They encountered savage bands of Indians and bandits, as well as wild animals and poisonous snakes. In the Mato Grosso and the Bolivian Cordilleras, they discovered many beautiful orchids and tillandsias; however, they were not too familiar with these plants at that time. Years later, after the brothers were grown and had gone into business for themselves, they remembered some of their discoveries and decided to make more collecting trips for fish and plants to export. They traveled from Rio into the unexplored interior searching for new and different genera, but were not always successful, although they did find caimans, giant snakes, piranhas, electric eels, and numerous poisonous snakes. The Transamazon Highway was badly needed in Brazil, but years went by before it became a reality, as there were many problems and disasters to be faced. Heiko decided he wanted to be one of the first to drive on the new highway and began planning his trip in 1974. He had offers from his friends to accompany him, but when in August 1975, when he was ready to start, nearly everyone backed out. Many workers had been killed in building the highway, and headhunters were still to be found in the interior. Even Micha was undecided until the last moment, because he did not want to leave his farm. A number of roads shown on the maps did not actually exist, and bridges and long stretches of road were almost impassable because of daily flooding rains. Heiko and his wife flew to Manaus on the Amazon where they were to meet Micha, who was to drive the 3,000 km along the coast from Rio to Recife on the Atlantic, using the new highway. He would carry all their supplies in the car with him. At this time Brazil was experiencing one of its longest droughts. Over the first part of the route, Micha found most of the vegetation along the road had been burned by the inhabitants. Thousands of beautiful blooming trees, covered with orchids and bromeliads had been destroyed by the fires that had been set. As Micha drove over Serra do Mar BR116 to Teresopolis, he saw the lovely red sophronitis blooming alongside many vrieseas. From Paraibi to Campos he passed interesting rocky cliffs covered with ground orchids and blooming bromeliads. As he left the State of Rio de Janeiro, he entered the State of Espirito Santo, where he found innumerable red bromeliads, cacti, and yellow-blooming oncidiums. He drove near Victoria, a big modern seaport. On the 300 km-long beach here, grow cyrtopodiums, cryptanthus, cacti, vrieseas, tillandsias, and many low trees. Espirito Santo is the smallest state in Brazil, but it is larger than Switzerland. Driving day and night he finally reached Salvador, the oldest city in Brazil founded in 1549. It has 365 churches and 365 holydays. Along the streets he saw street vendors in beautiful costumes, fruits of all kinds, food, and "Azeite de Dande", an aphrodisiac. 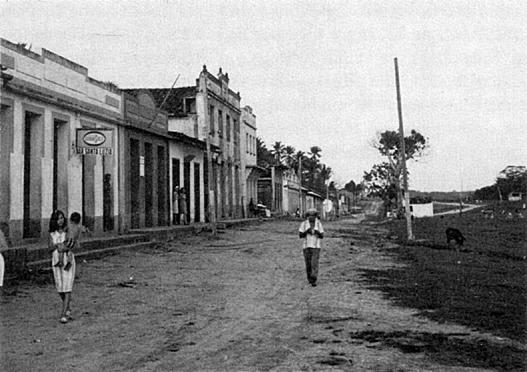 From here, Micha proceeded along the coast north to the state of Sergipe, arriving in the beautiful clean city of Aracajo. Previously this area had been only an animal farm. Around the city on the trees, he found Neoregelia ampullacea var. tigrina, catasetum, Aechmea warasii, whose large red berries hung low everywhere, and large clumps of Aechmea fosteriana. There were also T. andreana, Vriesea guttata with its pink inflorescence, and Billbergia macrocalyx with its spotted leaves. Crossing the Francisco River he entered the state of Alagoas where he found the beautiful Cattleya labiata var. leider, which is almost extinct. This small state, with its many lakes and lagoons, palms and beaches, is a delightful place. After a refreshing swim in the ocean, Micha started his last 260 km across the State of Pernambuco to Recife. He still had a good two-lane asphalt road to travel. He crossed many rivers, and saw many trees filled with Aechmea orlandiana, A. nudicaulis, A. fasciata var. purpurea, and nests of Tillandsia bulbosa. Here, in Recife, Micha met Heiko and his wife, who had decided to meet him in this interesting old city. While here Micha had to do the shopping for the difficult trip ahead. There would be no place to get supplies on the road ahead. They spent their time resting in a good hotel, eating the special seafoods of Recife and listening to the natives telling about the various macumba rituals and celebrations. They also met men who had been hired to work on the highway. In the beginning, they told him, there had been 1500 men with 315 machines to start the first 1000 km to Maraba. In Maraba, 5000 men had already returned from the highway, "the street of mud and dust," because the highway stopped in Picos. However, from Recife there was a good highway north as far as Natal in the State of Rio Grande do Norte. Micha and Heiko were not discouraged by the stories and left Recife continuing north. They went through the town of Fortalezza in the State of Ceara. The bromeliads and Cattleya labiata that once grew here are now extinct. The highway now took them to the State of Piaui. Here, there had been no rain for eight months, and everything was hot and burned. 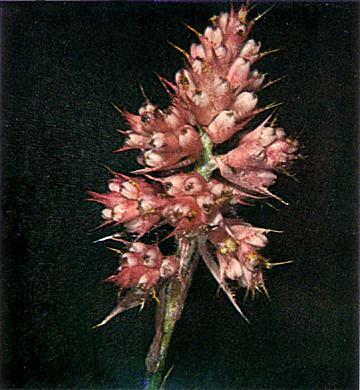 They found the "prickly" bromeliads such as dyckias, hechtias, and Bromelia serra. In some of the dry hard ground, they found Navia acaulis. Along the cliffs were orthophytums, cacti, Pseudananas macrodontes and Puya densiflora. Here the deadly black widow spider lives. They saw tamanduas (ant bears), coatis (nose bears), porcupines, and many other animals. Finally they arrived in Picos, where the asphalt highway stopped. They continued on Highway 230 through the State of Piaui to Floriano on the border of the State of Maranhao, crossing the Paranaiba River. The capital of this state is Sao Luis, which was founded by the French in 1612. This state is rich with oil from the palms "Babaqu." The soil is very fertile, and there are many marshes. In a few of the high trees, they saw interesting philodendrons, orchids, and the following bromeliads: Guzmania lingulata var. minor, Billbergia vittata, Aechmea chantinii, Tillandsia anceps, and T. lindenii. From here, they turned south, arriving at Imperatriz, on the border of Goia and crossed the Belem-Brasilia Highway BR 010. They crossed the Araquaia River and took a boat looking for water plants and fishes. They followed the Tocantins River into the state of Para. Here, in September 1972, the first 1000 km of the highway was dedicated. They went through Indian country, crossed a number of rivers and reached Highway 230. It still had not rained, and they were constantly in a big red dust cloud. The heat and the mosquitoes were almost unbearable. There were forests on the left and the right, but the trees were very tall, up to 70 meters. Since they were so high, there was no way to reach the plants that grew on them. There was no traffic on the road at this point, for the road had not been asphalted. In the rainy season, this area is nearly impassable because of the mud and water. Highway 230 took them to the State of Amazonas. They crossed the Manaus-Brasilia Highway BR080. Here they were in the biggest jungle in the world, and all around them were giant heliconias, marantas, anthuriums, philodendrons, ferns, a very few orchids, and hardly any bromeliads. There were so many plants that forty volumes of Flora Brasiliensis would not cover them all. In this area several wild tribes of Indians are still to be found. To build 3,000 km of this road through the jungle, it was necessary to cut down trees over 70 meters high. Some of these trees were so large, they had to be blasted apart in order to remove them. This was the hardest stretch of road to travel. There were no facilities of any kind; they had to sleep in the open surrounded by pests of all kinds, and there was always the danger of typhus. They did not dare to think of what would happen if their car were to stall. Somehow, they got to Humaita, which is located on the Madeira River, the largest tributary of the Amazon. From here, a good road, 319, goes to Manaus, and supposedly farther towards Venezuela and Caracas and south to Porto Velho and Sao Paulo. It took 4,500 engineers and workers to build this stretch of road. There is more rain in this region, from Manaus to Porto Velho, than perhaps anywhere else in the world. However, Manaus is no longer isolated, for this beautiful new highway, 319 is asphalted. 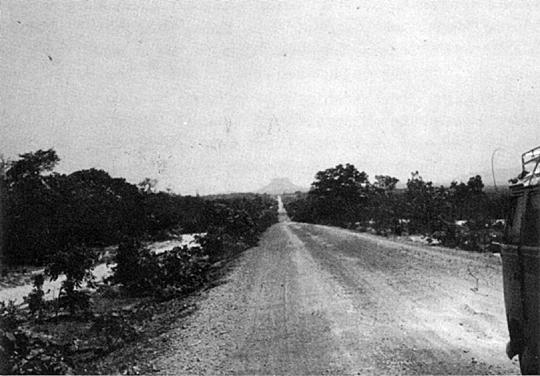 Micha and Heiko drove on this fine road to Porto Velho, which is not far from the Peruvian border. It is now a nice city with modern hotels, airport, and good stores. They continued on to the State of Acre which borders Bolivia and Peru. At one time this region was rich in rubber plantations. Unfortunately much of the land has been cleared. Heiko wanted to go all the way to the border, but the road was under construction, and he went only a short way before he got mired down. In the meantime the rains had started, and they had to turn around and go back. They drove past the Guapore, an important tributary of the Madeira River. Here, they found many interesting fish and plants. They found Billbergia zebrina, Cattleya violacea, cactus, and many interesting white tillandsias. Finally they reached Cuiaba, the capital of Mato Grosso. By this time their car was in bad shape and required repairs. They found a nice hotel, had a good dinner, and rested for their last sprint. Heiko had to do all the driving for Micha had typhus. So they went back through the states of Mato Grosso, Goias, Minas Gerais, and Sao Paulo. From the city of Sao Paulo, they traveled over a very good two-lane toll road, home to Rio de Janeiro. Several years ago I was given a single plant of this fine form of Neoregelia ampullacea. I was immediately impressed by its very short stature of just three or so inches tall; by its deep maroon to black color which extended over so much of the body of the plant as well as the leaf blades; and by its over-all symmetry and neat appearance. As time passed I grew to appreciate this little gem even more for still other good qualities: its rapid clustering habit, which allowed a colony of plants to build up readily; its two-and-a-half to three-inch stolons, which almost prevented crowding of growths and an entwined appearance; and its long life span of three years and more, which allowed for a sizeable cluster build-up before the oldest members died and had to be removed. In fact, as far as I was concerned, this little plant had just about everything that I could look for in a possible stud plant in order to breed for small to medium-sized hybrids that wouldn't take up much space and that could be grown for years in very small pots or on tree fern chunks. It wasn't long before I began to envision hybrid possibilities from it. First, however, I felt that I should try to find out just what had been done by other hybridizers with other forms of this little species. Then I kept thinking about the strange things that could possibly result from such plants as N. carolinae, N. pauciflora, and with some of the exquisitely colored hybrid neoregelias on the market and in collections today. Well, I realized only after an exhaustive search that there is not very much information on record about the breeding behavior of any of the neoregelias — species or hybrids. Therefore, I had to search out the answers to all of my questions myself by way of a comprehensive breeding program with the species, then evaluate and record the results. Since it takes a minimum of two years to grow to maturity any of the neoregelias from seed even in our long, hot growing season along the U. S. Gulf Coast, the answers would be slow in coming. In fact, quite often, a period of three or four years is required to bloom seedlings from those many-leaved and larger species that normally take two or more years to bloom from pups. Well, five years have gone by now since I first began using this little neoregelia. Startlingly interesting and beautiful hybrids have resulted and much information about the breeding behavior, not only of this little plant, but also of many other neoregelia species, has come to light. All of this will be of value for future reference and use. So far, five new neoregelia hybrids and one new neomea have bloomed. Generally speaking, N. ampullacea, var. tigrina 'Midget' has been dominant for size and shape. The resulting hybrids have varied in color, size, markings, leaf substance and manner of producing pups depending on the other plant used with it. For instance, where the other parent was a plain, soft-leaved green plant, such as N. carolinae or N. compacta, the progeny were thin-leaved types with leaves more or less green and adorned with lovely stripes and bands of red, maroon or brown. Also some heavily flecked or dotted plants have shown. When crossed with red or maroon-colored species or hybrids in the Neoregelia marmorata group, most of the progeny have had dark red to purplish red bases and with heavily spotted sheaths and leaves. And when crossed with a plant known locally for its intensely black-red color, the resulting progeny have been most unusual: about six to eight-inches tall, jug-shaped and maroon in color with almost black barring. They are really dark and the shape is something else! Depending on whether the other parent was stoloniferous or not, the youngsters have varied from tightly-clustering to long-stoloniferous, but all are beautiful. While all of these new neoregelia hybrids are most unusual and interesting, I feel that the big surprise to everyone will be the new Neomea hybrid. Not only is it a distinct novelty — and a near miniature — but it is a very fine grower under nearly all conditions. I intend to call this one × Neomea 'Stardust' — a most descriptive name! But more about this one in a separate article. For the most part, where two species are used to make a new hybrid, all members of this first generation have been remarkably uniform in every respect. This is exactly what was expected. When a species and a hybrid were crossed together, various groupings for similar characteristics could be made. But, when two hybrids were used as parents, just about anything could be expected among the progeny. And it is from this type of breeding that the most unexpected and unusual things are coming! Please permit me to digress for a few moments to make a point in behalf of all hybridizers. I want to cover this point here because I know that the average bromeliad fancier has very little or no knowledge of the laws of heredity and perhaps no experience with seedlings. When a cross is registered, the total seedling population of that cross must all be registered under the same name! Even thereafter, each time the same cross is repeated, the resulting seedlings have to be called by that same name as registered. A new name is not valid. Yet, there is nothing to say that all of these seedlings have to be alike in color, shape, markings, hardiness, vigor, ultimate size, etc. — they are separate individuals and they can and do vary one from another. To repeat, when this hybrid cross is registered, all of the seedlings will be given the same name. This is because they all share the same parentage. Remember that the cross is registered — not the individual plants of the cross. In still other words, seedlings first of all derive their identity from their parentage and not from any individual characteristics. However, if further identity is desired in order to single out a particular plant from the rest of its siblings, a cultivar name is hung on behind that name given to the whole cross. Different cultivar names may be given to any or to all of the different plants within this same cross. On the other hand, all vegetative propagations of any single plant that has been given a cultivar name must also retain that same cultivar name — all such propagations are genetically alike. Remember, as well, that the cross name must precede the cultivar name in all instances to afford total and proper identity to any individual. Well, this is only a pint-size idea of what is going on here. There are dozens and dozens of new hybrids awaiting names. Second and third generation hybrids are in the seed flats. I am sure that totally new colors and patterns will make their appearance in the not-too-distant future. Yes, Neoregelia ampullacea. var. tigrina, 'Midget' has indeed been a rewarding plant with which to breed. Each of its hybrids has been easy to grow. It has offered a refreshing, new look as far as shape is concerned. 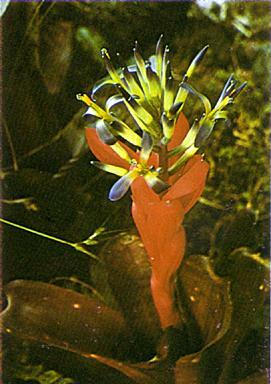 Color derived from it does not go pale as does that of many other neoregelias when subjected to less light than the average neoregelia requires. 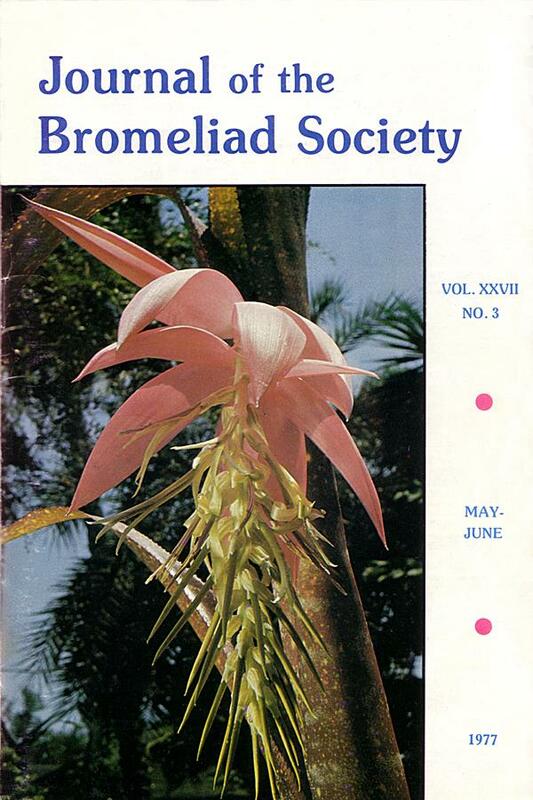 Incidentally, by June, 1977, when the Bromeliad Show and Conference rolls around, we hope to have hundreds of new and beautiful plants of our own making to show to all visitors to New Orleans. I know also that the area Bromeliad Societies have great things planned for that time. If past shows are any basis on which to judge the coming event, all visitors have a treat in store. Well over a thousand plants is the average for a show here — and the plants are all so expertly grown! The growing conditions all along the U. S. Gulf Coast are ideal for Bromeliads. The neoregelias are particularly beautiful. This is probably a hybrid, as there is no official record of it as a species. Contrary to the opinions of many biologists, most and perhaps all epidermal trichomes have evolved to perform one or more functions of significance to the plants which bear them. The roles that stem and foliar trichomes play are both varied and numerous. Some are obvious, such as the excretory activities of salt glands of halophytes, the secretory capacities of digestive hairs of many carnivorous species and the light-reflecting and insulating qualities of the indumentum produced by certain cacti and other drought-enduring xerophytes. Recently, more subtle functions of plant hairs have been recognized (see Rathcke and Poole, 1975). Many of these attributes involve defense mechanisms. Some trichomes act by simply obstructing feeding attempts while others offer protection against certain phytophagous insect larvae by puncturing the bodies of these creatures as they attempt to crawl over the plant surface. Although far from complete, the developing picture of trichome function already supports the supposition that most plant hairs perform some (although perhaps yet undiscovered) task of adaptive significance to their bearers. At least since Schimper's classic work on epiphytes (1888), botanists have known of the absorbing qualities of certain bromeliad trichomes. Evidence now in hand indicates that the characteristic peltate hair of Bromeliaceae has indeed been subjected to considerable structural and functional refinement during the evolution of this family and that this unique organ is now indispensable to many bromeliads occupying epiphytic or arid terrestrial habitats throughout the New World tropics. Just how widely these refinements vary within the family and what benefits or liabilities other than enhanced foliar absorption bromeliad trichomes might provide these plants remains largely unknown. In order to appreciate the central position the foliar trichome has occupied in bromeliad evolution and the role this structure continues to play as a primary facilitator of the specialized ecological strategies exhibited by many epiphytic members of Bromeliaceae, one must be aware of certain ecological parameters of the forest canopy and of the major adaptive strategies represented in this remarkable family of flowering plants. Most taxonomic treatments of Bromeliaceae divide this assemblage of about 2000 species into three subfamilies. 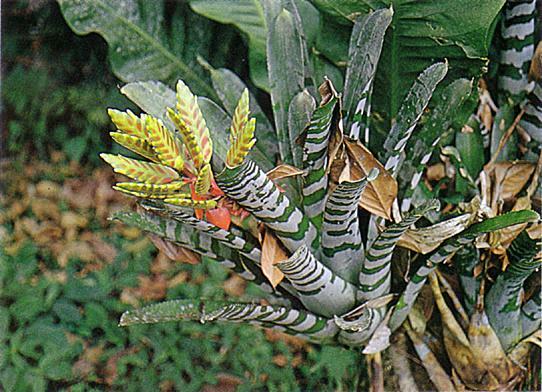 Adaptive radiation has been considerable and bromeliads are found in a great variety of tropical and subtropical habitats. Although populations with equivalent ecological strategies occur in more than one subfamily, each of these three taxa probably arose independently from some now extinct terrestrial ancestral group (Benzing and Renfrow, 1974a). 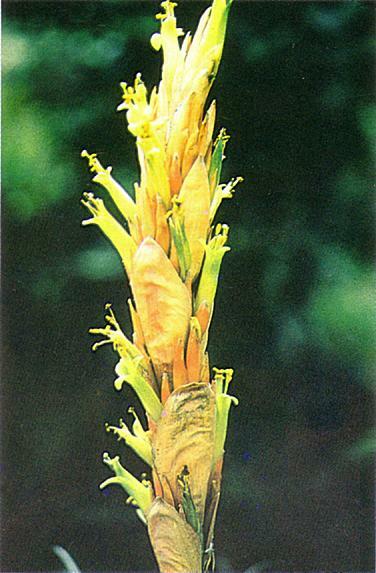 Most primitive of extant bromeliads are the pitcairnioids, or members of subfamily Pitcairnioideae. These species are almost all mesomorphic or xeromorphic terrestrials with well-developed root systems, relatively unspecialized foliar trichomes, and habitat preferences for open moist or dry sites. Floral morphology is diverse but the most generalized fruit and flower types of the family are found here. Major genera are Hechtia, Dyckia, Pitcairnia and Navia. If only floral and fruit morphology are considered, Tillandsioideae must be designated a fairly unspecialized taxon. In itself, this evaluation would be misleading, however, since most tillandsioids occur in extreme environments and can only accomplish this feat because they possess many specialized adaptations in their vegetative organs. Specifically, many are adapted for very dry exposed environments in the forest canopy and possess highly specialized growth forms, reduced holdfast root systems, highly organized epidermal hairs with pronounced absorptive capacities and unusual nutritional and water balance mechanisms (Benzing, 1973). Representative genera are Catopsis, Tillandsia and Vriesea. Bromelioideae is the largest subfamily of the three and contains many epiphytic members. Terrestrial bromeliads are usually xeromorphic inhabitants of exposed environments. Compared to the tillandsioids, bromelioid trichomes are not highly specialized either structurally or functionally. Most epiphytic bromelioids are tank formers as are many of the terrestrials. All produce inferior ovaried flowers and baccate fruits. As such, they are considered by conventional taxonomic criteria to be the most advanced of the bromeliads. 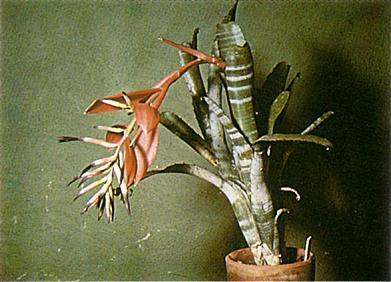 Large bromelioid genera include Aechmea, Billbergia, Cryptanthus and Neoregelia. Several ecological classifications which cut across these taxonomic boundaries have been formulated by biologists to categorize and describe the numerous life strategies which exist in Bromeliaceae (Schimper, 1888: Tietze, 1906; Pittendrigh, 1948; Benzing and Renfrow, 1974a). 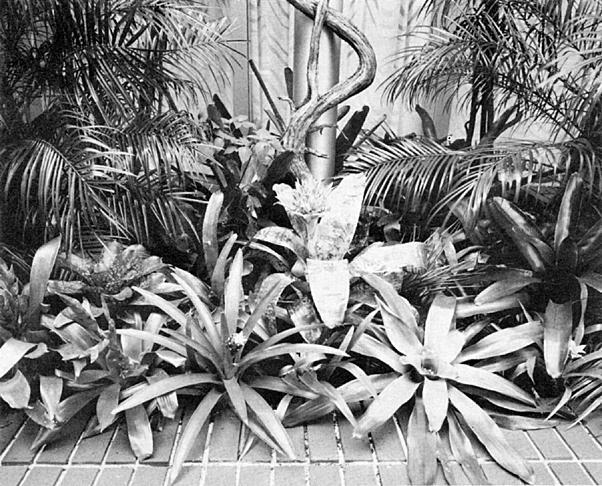 Most elaborate of the attempts to accomplish this end was a scheme authored by Colin Pittendrigh while he studied the bromelioid flora of Trinidad. This particular ecological taxonomy of Bromeliaceae is a refinement of an earlier system conceived by the famous German plant geographer F. W. Schimper in 1888. Like Schimper's classification, this scheme and an updated one by Benzing and Renfrow (1974a) emphasize methods of mineral and moisture procurement and the morphological characters apparently related to these functions. Trichomes are given substantial consideration by all five authors. The salient features of each of the four major categories representing the backbone of these taxonomies are presented below. Type I. Soil-rooting species without tanks or absorbing trichomes. This first group encompasses all the soil-rooting bromeliads which lack tanks and have no absorbing trichomes. Nutrients and water are acquired by these plants from soil by an extensive system of absorbing roots. Most Type I bromeliads do have peltate hairs, but these epidermal appendages seem to have little if any uptake capacity (Benzing and Burt, 1970). As soil-rooted terrestrials, Type I species exhibit the basic habitat preference of Bromeliaceae. While this group contains taxa with the most primitive reproductive structures known in the family, its taxonomic status is mixed since some bromeliads (members of subfamily Bromelioideae), with their more advanced reproductive structures, are also included. Type I bromeliads are exemplified by most pitcairnioids, both thin-leaved and succulent species, plus certain bromelioid genera including Orthophytum, Cryptanthus and Bromelia. Type II. Soil-rooting species with rudimentary to moderately developed tanks. Plants of Type II differ from those of the first category in that the latter possess some impoundment capacity attributable to expanded, tightly overlapping, leaf bases. Most exhibit at least moderate leaf succulence. 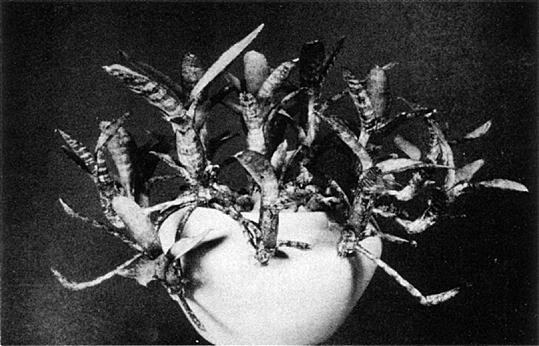 Although typically found growing in soil, the roots of these more specialized terrestrials sometimes fail to penetrate the substratum when growing in dry or rocky areas and may instead grow upward into the leaf base tanks to exploit the debris and moisture which often collects there (Pittendrigh, 1948). Some Type II species have apparently evolved a mineral nutrition and a water economy sufficiently independent of the substratum to permit them to live on sterile arid soils or as saxicoles. These are the same requisites and tolerances which, when sufficiently well developed, will support life in dry epiphytic environments. In this sense, Type II species found on arid sites are preadapted for tank epiphytism (Pittendrigh, 1948). Type III. Tank species with holdfast roots that can be absorptive and trichomes that exhibit moderate to high uptake capacity. This third assemblage contains hundreds of tillandsioids and bromelioids but few, if any, pitcairnioids. Type III species differ from Type II plants by their possession of more broadly expanded leaf bases, stiff, upright, trough-like blades and their facultative to obligate epiphytic habitat preferences. Type III bromeliads usually maintain a large supply of water and debris in their leaf axils over the entire year; this soil substitute serves as the principal source of moisture and mineral nutrients for the rosette whether the specimen is growing as a terrestrial or epiphyte. Almost all members of Type III do exist, at least occasionally, as epiphytes, but many exhibit varying tendencies toward terrestrial or saxicolous life. A few (e.g., Vriesea glutinosa) appear to be obligate in their choice of rock as a substratum (Pittendrigh, 1948). As the designation implies, the trichomes on the leaf sheaths of Type III species supposedly facilitate foliar moisture and mineral uptake. Recent experiments reveal that tank tillandsioids possess trichomes with pronounced absorptive capacities while those associated with the leaf sheaths of bromelioids are considerably less active as absorptive organs (Benzing et al, unpublished manuscript). Type IV. Tankless xeromorphic species with dense investments of absorbing trichomes and nonabsorptive holdfast roots (atmospherics). Schimper (1888) chose the name "atmospherics" for these plants because members of this category have relinquished all reliance on the soil or tanks as sources of moisture and mineral nutrients. A complete series of transitional forms exists between typical Type III and Type IV species. Extreme Type IV bromeliads are exclusively xerophytic members of the genera Tillandsia and Vriesea and are always characterized by a dense cover of absorbing trichomes over their shoot surfaces and by succulent leaves with no open leaf base impoundments. In a few cases, such as Spanish moss (Tillandsia usneoides), root development is sporadic or virtually nonexistent except in the seedling stage. No matter what the degree of development, however, the roots of atmospherics appear to have little or no absorptive capacity and exist primarily to anchor the shoot to a substratum. Type IV bromeliads subsist entirely on salts dissolved from airborne dust or leached from the host tree or from rainwater itself (Benzing, 1973). As such, these bromeliads rank among the most tenacious of all higher plants and comprise a group of epiphytes adapted to the driest and most nutrient-deficient sites found in the forest canopy. After studying the distribution and habitat preferences of bromeliads in Trinidad, Pittendrigh (1948) found it necessary to construct an additional series of categories which cut across the four groups based on mineral nutrition and water balance mechanisms and instead emphasized light requirements and carbon nutrition. Trinidadian bromeliads, the epiphytic ones at least, and quite likely bromeliads elsewhere, exhibit varied and distinct light requirements. While investigating the relatively undisturbed forests on this island and their associated epiphytes, Pittendrigh found that the bromeliad flora could be segregated into distinct groups which tended to occupy different vertical zones within the forest canopy. Three categories were recognizable. Moving down the forest profile, a first group encountered occupied only the tops of trees. These species revealed an affinity for high light exposures in all the habitats they occupied. When growing in arid-land forests with a sparse foliage or along roadsides or cliffs in wetter areas where strong light penetrated to the lower branches of the tallest trees, members of this first group flourished from the top to the bottom of the canopy profile. Somewhat deeper into the dense canopy of moist forests a second assemblage was encountered. This one seemed to prefer intermediate levels of illumination rather than full sunlight or heavy shade. In the lowest reaches of the deepest, most humid forests, were found only specimens of species capable of tolerating dim light. As in Pittendrigh's first classification, certain growth habits and conditions of the trichome cover are correlated with these ecological groups. A brief summary of each group and its characteristics is provided below. Exposure group. These species occur in full sun or at most in light shade. They are either atmospherics or tank species with compact rosettes and deep impoundments. Because their trichome caps or shields are often so numerous that a confluent layer is formed, the shoots of exposure bromeliads usually have highly reflective, silvery surfaces. Exposure group plants may be equipped to endure long dry seasons (atmospherics) or they may be adapted to climates where rainfall is moderate to heavy and frequent (tank species). Type I and II terrestrials of open arid habitats should also be considered members of this group. Examples are Tillandsia juncea, T. usneoides, Catopsis sessiliflora (at least in Trinidad) and most species of Hechtia. Sun group. Species of this second category in Trinidad are mostly Type III bromeliads with large tanks. When growing in moderate shade, their leaves tend to be broad, thin and green. The leaves of sun group species are less reflective than those of exposure types either because fewer trichomes are present on the former or the caps of these appendages are tightly pressed against the epidermis, a feature which seems to make them more transparent. Examples cited by Pittendrigh are Tillandsia bulbosa and Aechmea nudicaulis. Shade-tolerant group. Most species belonging to this category are tillandsioids with small tanks and wide, long, pendant, deep-green leaves. Their shoots are only lightly trichomed and frequent rains and high humidity are required to prevent their shallow tanks and mesomorphic shoots from drying out. 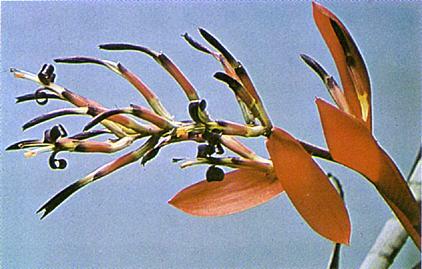 Shade-tolerant species such as Guzmania lingulata and Vriesea simplex may be restricted to the lower canopy only because of their high humidity requirement. Evidence that shade-tolerant species can endure maximum illumination without damage when ample humidity is available is provided by the occasional specimens which thrive in full sun on a branch over a river or on some other exposed but moist site. When subjected to full sun, these plants, as well as many other tank types, develop a deep red pigmentation which probably acts as a sun screen by blocking much of the ultraviolet and visible radiation contained in sunlight. Shoots may also become more compact and thicker and therefore more drought-resistant in strong light. According to the classification based on mineral nutrition and water balance mechanisms, foliar permeability, the reliance of the shoot on its leaves rather than on the root system for moisture and mineral salt procurement and therefore the nutritional independence of the plant from the soil, increases from Type I to Type IV. A different but related physiological concomitant parallels Pittendrigh's exposure categories. If individuals from each of the three light preference groups are assayed for photosynthetic efficiency, a predictable trend is obtained (Benzing and Renfrow, 1971a, 1971b). Photosynthetic efficiency, in this instance, is expressed as the effectiveness with which dim light is used by a plant to achieve a given proportion of its maximum photosynthetic output. Species with low efficiencies might require exposure of 50% or more of full sunlight to produce a maximum photosynthetic rate. A more efficient shade-tolerant individual might reach its light saturation point at only 20% of full sunlight. Species exhibiting low efficiency, in contrast, have high light compensation and saturation points. As expected, plants of Pittendrigh's shade-tolerant group possess photosynthetic systems with high efficiency — i.e., they are able to achieve substantial proportions of their maximum photosynthetic output in very dim light — whereas those of the exposure group are much less efficient under the same levels of illumination. Previous studies suggest that most sun and exposure group species probably exhibit crassulacean acid metabolism (CAM) while the shade-tolerant tank tillandsioids are more likely to employ the Calvin-Benson carbon fixation pathway directly (Coutinho 1965, 1959; McWilliams, 1970; Benzing and Renfrow, 1971b; Medina and Thoughton, 1974). Forest canopies are generally more arid and infertile than the ground below where resident terrestrial plants obtain water and nutrients from a soil. Unless relative humidity is constantly high or episodes of precipitation or heavy fog occur at very close intervals, as is the case in some cloud and rain forests, the substrata for epiphytes (i.e., the bark surfaces) are subjected to considerable drying. Testimony to the general aridity of the epiphytic biotype is obvious in all but the epiphytic residents of the most humid regions; most vascular epiphytes exhibit at least moderate xeromorphism plus associated physical and physiological attributes designed to enhance water use efficiency. Succulence, high stomatal resistance and a photosynthetic apparatus incorporating CAM are characteristic of many epiphytes and arid land terrestrials. Vascular epiphytes without impoundments such as the tank bromeliads possess must rely on features which allow them to absorb water rapidly when this commodity is available, that is, when the roots or other absorptive organs are wetted and the substratum is temporarily moistened by rainfall. Epiphytic orchids and aroids accomplish this task through the employment of a velamen or similar absorbent root tissue. 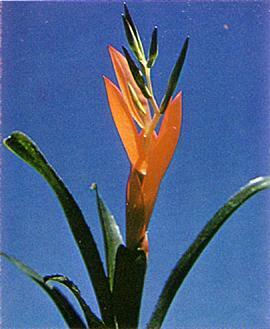 Xeric bromeliads without tanks exert the necessary absorptive capacities by relying on leaves equipped with foliar trichomes since their root systems tend to have rather limited absorptive capacities. Most mineral nutrients are also in short supply in the forest canopy. To meet these deficiencies, mineral use efficiency among at least the xeric epiphytic bromeliads is high, but the numerous mechanisms behind this complex adaptation are not completely understood (Benzing, 1973). High mineral use efficiency is required of extreme epiphytes because rainfall contains no more than minute quantities of each essential mineral element. Precipitation can be enriched by additional solutes leached from plant tissue as it passes down the forest profile but these inputs are usually not great. Measurements of stemflow and fallthrough in several tropical forest communities indicate that nutrient elements such as phosphorus, nitrogen and potassium are present in these natural fluids in concentrations of no more than a few parts per million. Preliminary efforts (Benzing and Renfrow, 1971c; Benzing and Renfrow, 1974b) have already provided evidence that the distribution and vigor of at least one atmospheric bromeliad is influenced by the availability of certain macronutrients in water passing through the forest profile. Many bromeliads, particularly those xeromorphic species without tanks and with the most reduced root systems, must cope with an additional restraint when opportunities do occur for moisture and salt procurement. Because their succulent growth habit results in a shoot with a low surface to volume ratio, transpiration rates per unit of moisture contained within the plant are low, thus increasing drought endurance. But when rainfall does descend the forest profile, absorption of moisture and salts would perforce be limited by this same size-form relationship since all the moisture and dissolved mineral matter required to supply the plant body must pass through the same plant-environment interface which, by its conservative dimensions, so effectively conserves tissue moisture. Any mechanism that would facilitate rapid absorption through the plant-environment interface while not producing concomitant increases in transpiration rates and mineral leaching through these same surfaces would obviously be beneficial, particularly to plants inhabiting unusually dry and nutrient-deficient environments. The bromeliad trichome in its most refined state is ideally suited to provide this advantage. Epiphytes, more commonly known as "air plants", are plants which live upon other plants. The most familiar examples are bromeliads, including Spanish moss, orchids, and certain ferns, such as the staghorns, all of which are found in the wild growing upon trees. Epiphytes are not parasites. They cling to other plants for support but do not invade the living tissues of their hosts. There are approximately 30,000 species of epiphytes among the higher plants, and these are found almost entirely in the tropical and subtropical regions of the world. Until recently there was not a single institution devoted to the study of epiphytes, which as a group are still poorly understood. Today there is one such place, and it is located in Sarasota, Florida, at the intersection of South Palm Avenue and U.S. 41. The Marie Selby Botanical Gardens, overlooking the bay in the very heart of Sarasota, is the world's only botanical garden specializing in the study and display of "air plants". A botanical garden is a rare and unusual place, a museum of living plants, and Selby Gardens is a true botanical garden devoted primarily to research and the advancement of knowledge relating to epiphytic plants. Selby Botanical Gardens owes its existence to the foresight of Marie Selby, a long-time Sarasota resident, who before her death in 1971, established a trust for the development and maintenance of a botanical garden on her property. Work on the Gardens was begun in earnest in 1973, and its doors were opened to the public in July of 1975. The Gardens are open every day of the year except Christmas from 10 A.M. to 5 P.M., for the enjoyment and edification of people who like plants. Admission is $1.00 for adults, while children under 16 accompanied by adults and school groups of all ages are admitted free. For most people the 6,552 square foot display greenhouse is the highlight of a visit to Selby Botanical Gardens. Its plant-laden rock wall with trickling waterfalls and its vine-covered trellises were designed to create the impression of a tropical rain forest. Epiphytes are the featured plants, of course, and they are displayed as they would be seen growing in the wild, upon trees and rocks, wherever that is possible. There is an area devoted to bromeliads, plants in the pineapple family, and another area decorated with hanging baskets of gesneriads, "air plants" in the African violet family. Orchids can be seen growing upon calabash trees, as they would be found in nature. Epiphytes of many other families are on display, including a birds-nest anthurium several feet in diameter and an unusually large staghorn fern. Orchids from the research collections are brought into the display greenhouse as they come into bloom, and the constantly changing displays of flowering orchids provide year-round color. Not all the plants are epiphytes. One area dominated by several large tree ferns features unusual terrestrial plants, such as the rare alocasia whose large green and purple leaves resemble a warrior's shield. Aechmea zebrina growing in the Gardens. The outdoor grounds are on a peninsula bounded on one side by Sarasota bay and on the other by Hudson Bayou. The outdoor landscaping was designed to capitalize on the Gardens' small size and its seaside location. The plan was to create a strolling garden which visitors could traverse slowly and easily in less than forty-five minutes, with stops to enjoy the plantings and the views provided by the natural waterfront location. A wide sidewalk takes visitors through the greenhouse and around the grounds, and it was designed so that the entire Gardens can be traversed comfortably by someone on wheelchair, without having to negotiate steps or curbs. The original plantings of the Selbys, including clumps of giant bamboo and some spectacularly large banyans, have been supplemented with additional plants over the past two years. Seaside or salt-tolerant plants are featured, including Florida natives and foreign imports of ornamental value. Local visitors interested in plants for their own homes and yards will be able to get landscaping ideas from the Gardens' plantings. Hibiscus is the most famous flowering shrub of the tropics, and Selby Botanical Gardens has the finest public display of hibiscus in Florida. Four beds, with 400 plants of over 100 different varieties of hibiscus, provide a year-round splash of color for the outdoor gardens. The newest and best varieties of hibiscus are featured, some with blooms of unusual colors and incredible size, up to 10 inches across. The Gardens is beginning a hybridization program to create its own hibiscus varieties. Epiphytes are featured in the outdoor landscaping of the Gardens as well as in the greenhouse. In one area near the Selbys' house there are many native live oaks, and these trees make excellent hosts for epiphytes. Hundreds of species of orchids, bromeliads, ferns, epiphytic cacti, and other "air plants" have already been tied to the twisting trunks and branches of these oaks, and some are in bloom at the present time. With perhaps 5,000 species of epiphytes presently in its research collections, Selby Botanical Gardens has a rare opportunity to experiment with the growing of these plants upon trees outdoors. For many, Selby Botanical Gardens is more than just a place to look at plants, it is an opportunity to learn more about plants. The plantings, indoors and outside, are in the process of being labeled, and each label will give the botanical and common name of a particular plant, its family, and its place of origin. Many school groups, from elementary school to college age, have already visited the Gardens on guided tours. Other groups, such as garden clubs, may also arrange for guided tours, at no cost beyond the basic admission fee, by calling the Gardens a few weeks in advance of their visit. A program of courses in practical horticulture and botany was begun in 1975 and is now being enlarged. Thirteen courses covering ten different topics have been announced for the first half of 1977. Some of the courses are about the care of house and indoor plants, while others deal with outdoor plants. Two evening classes are being offered for the first time, for those people who work during the day. The Marie Selby Botanical Gardens is strongly committed to research on epiphytes, in addition to its public display and educational activities. Five botanists are working with epiphytic plants from three different families, orchids, gesneriads, and aroids. When funds and space become available, new staff members will do research work on bromeliads, cacti, ferns, and other epiphytic groups. The Gardens publishes a scientific journal, Selbyana, which has already won the respect of the botanical community. Under the auspices of the American Orchid Society, Selby Gardens houses the Orchid Identification Center, to which over one thousand orchids, many of them new species have been sent from all over the world for identification. Without its research activities, Selby Botanical Gardens would not have been able to develop as quickly as it has. Three research greenhouses, built at the same time as the display greenhouse and completed in 1974, hold the research collections of plants. These plants, epiphytic and terrestrial, have been collected in the wild from all over the world by members of the Gardens' scientific staff and other botanists collaborating with them. Were it not for continuing additions to its research collections, the Gardens would not be able to constantly display rare and unusual plants, many of them new species never before seen. Without its emphasis on research, Selby Gardens would be an ordinary park rather than a remarkable new botanical garden. Selby Botanical Gardens is a non-profit, private institution and receives no public funds. The endowment left by Mrs. Selby provides about one-third of the annual income. The rest of its yearly income comes from admissions, sales in the Gardens' plant show and a newly opened book and gift shop, donations, and, most important, memberships in a group called Friends of the Gardens. Members receive free admission to the Gardens, discounts on most shop items and reduced rates for courses, a subscription to a bi-monthly Bulletin, free plant distributions, invitations to special events, and many other benefits. Memberships have recently passed the one thousand figure but they must continue to grow for the Gardens to maintain itself at its present level. The Marie Selby Botanical Gardens is a rare and wonderful asset to the Sarasota area, but it in turn is dependent upon the continuing support of the horticultural community for its existence. Thus far the community response has been most gratifying. There is also a steadily increasing number of visitors from beyond the county, state, and nation as the news spreads of a new botanical garden devoted to epiphytes. The plant material exhibited and studied at the Gardens should be of special interest to members of plant societies devoted to orchids, bromeliads, gesneriads, epiphytic cacti, ferns, begonias, azaleas, and others. The staff at the Marie Selby Botanical Gardens looks forward to a close contact with the members of these plant societies. Here it is dead of winter in Illinois, but that doesn't mean that all is dead in Illinois. In my basement that is crammed with summer refugees, life goes on. Late in the summer came near disaster. Since I buy most of my plants as seedlings, the majority of my plants are small and were packed closely together in rows. While watering one day I noticed, to my horror, that something had found my plants. Something had gone down the closely packed rows nibbling holes and eating entire leaves. I began looking for the culprit, scanning, I found nothing. So I removed every pot, looking it over. I found nothing so I put the plants back on the racks. The damage went on until I read an article in the July-August issue of the Journal of the Bromeliad Society that related the ravages of grasshoppers. As in the article, night raids were held producing five grasshoppers in three nights. After their execution for crimes beyond human tolerance, the damage stopped. The plants are small enough that they will outgrow the scars, but it will take some time. While the above trials tried to dim my first summer "out", the results in my plants far outshine the troubles I had. The growth and color obtained outside was astounding compared to the progress and color under lights. (How I envy those of you who grow outdoors the year round!). Last summer we vacationed in Florida and sent back 8 boxes of plants. (Some vacation, said my wife, early and late hours and tight schedules to meet in order to get to all the people and nurseries picked to visit in the short time we had.) This trip substantially increased my collection. Aechmea bromeliifolia, A. 'Bert', A. bracteata, Billbergia 'Muriel Waterman, and Androlepis skinneri, to name a few. But it also added black scale. As the snow flies I anxiously await the moderation of temperature and a change in the winds that signals the coming of spring and the migrating of bromeliads. T. Gephart, 1124E. Ridgely, Springfield, Ill.
During our recent freeze I learned one thing about bromeliads and that is the genus Tillandsia is the only one that is light frost tolerant. Although 85 percent of my plants are under 75 percent shade netting, my cryptanthus and aechmeas seemed to suffer the most. Outside under trees Aechmea fasciata, A. bracteata, and A. blanchetiana were all killed. Most ananas suffered some leaf burn, but not the extensive damage suffered by the aechmeas and the few Billbergia pyramidalis that were in an unprotected spot. It seems strange but vrieseas and guzmanias show no signs of frost burn at this time, as also do neoregelias and nidulariums. I am sure, however, that thousands of bromeliads died all over Florida unless covered or brought indoors, for our temperatures were 19°F. in the north to 26°F as far south as Miami. The freeze recently experienced by most of us in southern Florida is just now really showing its effects. In addition to much leaf damage and out right kill of a few plants, I've noted some center rot in the softer leaved plants, namely vrieseas and guzmanias. It might be worth your while to remove only the rotted center, empty the plant of water and treat with captan or similar fungicide. It could be that as so often happens with plants that begin rotting in the center, the outer part of the plant will produce a pup. We marvel at the adaptability of many species of bromeliads to different amounts of light, and also how easily they may "burn" when suddenly exposed to direct sunlight when they have been grown in the shade. Last fall we decided to place Aechmea fasciata, Nidularium 'Casmir Morobe,' Neoregelia carolinae, N. carolinae var. tricolor, and N. marmorata under pine trees where, due to the angle of the winter sun, they would be in full sunlight all day long. They did very well. As the sun moved north in spring and summer the trees shaded them at midday, but they were in full sunlight in the morning and afternoon. All grew well and without any injury. However, we had several plants of Aechmea fasciata which bloomed last November and were still attractive in May. They were kept in shade, under a roof but with good side light. In mid June we cut the inflorescence and placed the plants among others of the same kind where they received direct sunlight in midafternoon. In three days large "burned" brown spots appeared on the leaves. Plants accustomed to the light have not been injured. When buying new plants we have learned to be very careful not to place them in direct sunlight unless we know they have been grown that way. The severe drought experienced by the western states during the past two years has played havoc with many gardens. Although southern California is supplied with water from a number of aqueducts (like the Romans of old), water is now being taken only from the Colorado River. The water from this source is a horrible excuse for aqua pura — being almost too thick to pour and too thin to cut (at its original source that is). It is so alkaline that acid loving plants have a hard time making a go of it. Of course, the quality of the liquid stuff can be improved by a device known as reverse osmosis, but this is an expensive system and perhaps out of reach of the average grower. An inexpensive and easy method of alleviating the alkalinity is one suggested by Mulford Foster, and that is to use a light solution of acid fertilizer in the water used on bromeliads at all times. This can be done by the use of dispensers known as a Hoson or a Hydromix which fastens on to the hose. These cost in the neighborhood of $3.98, reasonable enough when one thinks of their value. For $140 one can get a Merit Commander Proportioner — that is an easy way to fertilize your plants automatically, and one worth considering. The newest edition of THE CULTURAL HANDBOOK is off the press and is now available to members. This is a revised, enlarged edition, containing 104 pages. Price to members is $3.50 post paid. Special rates for affiliates. For information write to Mr. Charles Wiley, 4036 Via Solano, Palos Verdes Estates, California 90274. Under preparation and now being printed is a new help for readers of the journal; it is A Glossary for Bromeliad Growers, compiled by Victoria Padilla and illustrated by Sue Gardner. With this handy guide, no article in the journal will be too technical for the most amateur of growers. This highly attractive vriesea is native to Colombia and Ecuador in areas ranging from 2,000 to over 6,000 feet in elevation. It is mostly epiphytic, although Mulford Foster found it growing as a terrestrial and on rocks as well as low on trees. The plant is quite variable in size, varying from 1½ to well over 3 feet in height. The numerous gray-lepidote leaves, which form a funnel-shaped rosette, measure from 1½ to 2 feet in length. Dr. Amy Jean Gilmartin believes the variability she noted in this plant is due in some measure to the fact that the stamens and stigma are slightly exserted, allowing for cross pollination. The plant is to be found in cultivation and is listed in several commercial catalogues.